Dark... Nether Regions "Into The Breach" is a very dark and scary place to be. "Into The Breach" is like the horror movie that was so real it actually scared the living hell out of me (think The Exorcist and Silence of the Lambs not Texas Chain-saw Massacre). The whole essence and aura surrounding this album sends chills down the spine. Heavily influenced by Neurosis, Nether Regions beautiful sound-scapes are twisted by a looming sensation of paranoia and loneliness. For the style of music, "Into The Breach" never becomes tiresome and unexciting. The album intensifies as it progress's from the inception of "Into The Breach / Spanish Werewolves" to the climactic "Alpha / Omega" and apexes with "Outrun The Sun". One of the stand out tracks on ITB is "Pale Faced God". PFG throws a left hook compared to what the previous tracks bestow. The foundation of PGF is a mellow acoustic picking, backed by a jazz-like electric strumming, culminating with the addition of the drums. The ascension plateaus giving the acoustic picking front stage, only to be extinguished by an immense blast. Again you will find the Pike-esqe vocals and lighter moments of picking and drumming really pulling this song together. "Alpha/Omega" is a must listen on ITB. Keeping a traditional style heavy metal beat and harmony, were could Nether Regions go wrong? The repetitive riffage and onslaught of percussion truly build the adrenaline perfectly. Right up to the big "break-down" (think some serious moshing" at the 3:20 mark). The conclusion brings a spiraling drum roll into an outstanding guitar solo. "Outrun The Sun" is an ominously warm melody. Like the end of the movies where all seems well, the daylight breaks through, and you have survived... but there is that last moment before the screen cuts to black, and the villain rears it's ugly head, that is "Out Run The Sun". The mix of the static aura waving in the back ground while Kyle Bates and Todd Pidcock weave a soothing trance-like state with their guitars and then Joe Wickstrom's eerie lyrics can be petrifying. I'm never listening to "Into The Breach" when I'm alone in the dark. Especially after seeing the artwork! What is that? Burning, deteriorating flesh and hair?? Maybe one of the guys from the band can fill us in about the artwork, I'm certainly interested to hear the story behind it. That being said, this album is a success. 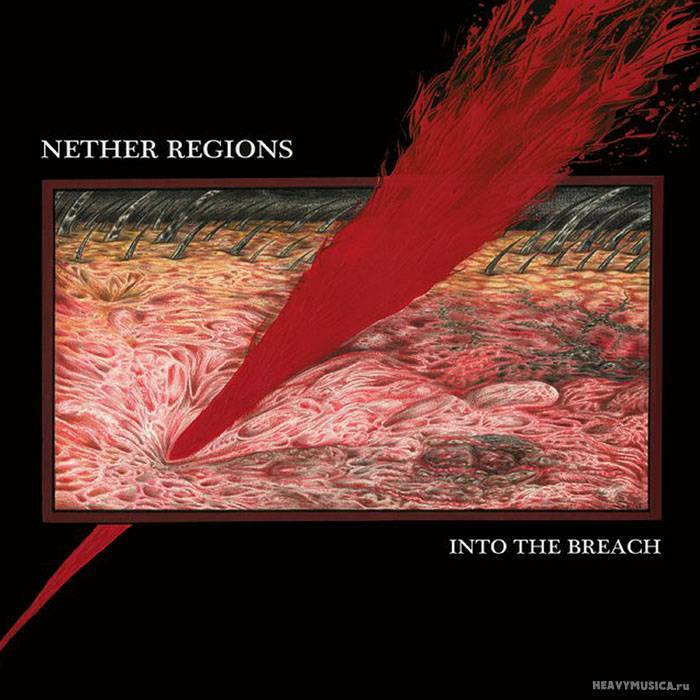 Nether Regions, without a record label, are using Bandcamp to release their tunes. See the link after the jump. Now get over there and pick your copy up! I'm feeling a respectable 7 out of 10.